source The proposed new zoning code for Lower Merion Township is 328 pages of densely packed text, charts, and drawings. At a time when we hear over and over again from residents that they are deeply concerned about overbuilding (especially of apartment buildings), the explosion of public school enrollments, and increasing traffic congestion, it comes as a surprise to see a proposed zoning code that encourages more densely packed commercial and residential apartment buildings in central Ardmore, as well as along City Avenue. 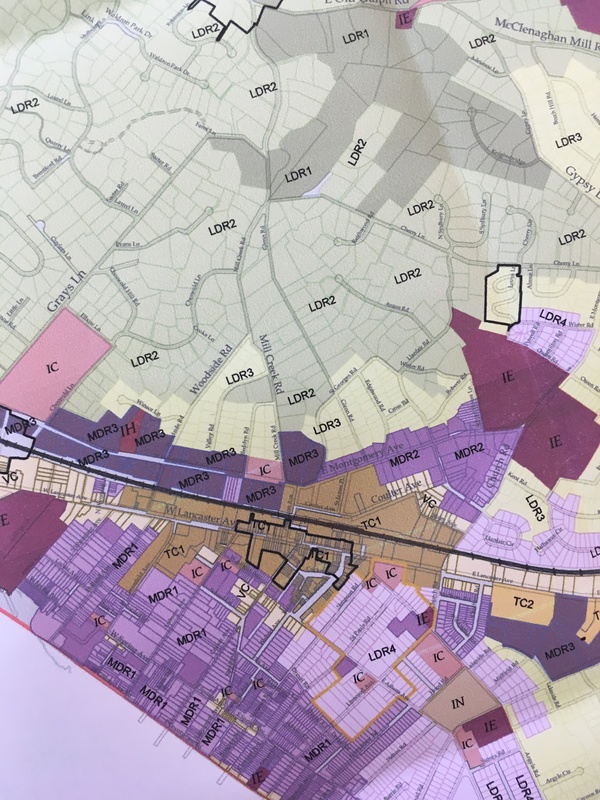 watch The key to understanding the proposed new zoning code is to look at the new zoning map, and then match the labels for each zone to its description. follow link The proposed code divides the Township into 3 main zoning categories: residential, commercial, and institutional. The commercial and residential portions are the ones that affect most of us. cialis online 20mg The residential category is divided into Low Density Residential (LDR) for single-family homes, and Medium Density Residential (MDR) for multi-family buildings, and each of those is subdivided into 3 or 4 subzones. Most of these subzones are essentially the existing ones under new names. LDR1, LDR2, and LDR3 and MDR1 and MDR2 are substantially similar to the current R zones in the existing zoning code. However, MDR3 packs a substantial amount of greater density and height into smaller spaces than as provided by the existing code. Currently the zoning code imposes a 65-foot height limit on apartment buildings (R7 zone); MDR3 raises that limit to 78 feet. Currently the code requires a 2500 square-foot lot for apartment buildings; MDR3 reduces the minimum lot size to 1600 square feet. If you look at the new zoning map, you will see that the proposed MDR3 zone runs along both sides of Montgomery Avenue, starting with the two-thirds of the Ruby’s Lot (now a vital parking lot for Suburban Square), and continuing westward. The new code proposes three kinds of commercial districts: Town Center 1 (TC1), Town Center 2 (TC2), and Village Center. Our focus is on TC1, but TC2 also raises issues. TC1 is the most densely designed new zone for commercial development. Suburban Square and most of downtown Ardmore, including Rittenhouse Place, Cricket Avenue, and Greenfield Avenue, is in the proposed TC1 zone. Ardmore has thus been specially selected as appropriate for the most intensive commercial zone outside of the City Avenue corridor (dark brown on the map). In TC1, Mixed use buildings can be 5 stories; the ground floor story is required to be a minimum of 14 feet high and can be a maximum of 24 feet; stories above the ground floor must be a minimum of 12 feet and may be a maximum of 16 feet in height. Thus, a building could be 88 feet high; this is 23 feet higher than the 65 feet that is now generally allowed in commercial districts under current zoning, and almost as high as the 90 feet that was specially allowed for the Dranoff building called “One Ardmore Place,” currently under construction on the former Cricket Lot. The MUST zone has been eliminated in the proposed new zoning code, but its essential features are incorporated into the new TC1 and TC2 zoning districts – notably, height and density. The name has changed but the consequences remain the same. The Lancaster Avenue corridor east of the Church Road Bridge is designated TC2, the second most intensive commercial district outside of the City Avenue districts. In contrast to TC1, it is automobile oriented rather than what is conceived of as the pedestrian friendly concept for TC1. A couple of small pockets of VC (“Village Center” are tucked in; these are supposed to be very locally focused commercial centers of relatively low density. TC2 proposes auto-oriented strip center development, with parking in front of the stores, of a type that the Building and Planning Department of the Township has vocally disfavored for many years. Strip centers with parking in front are not considered to be pedestrian friendly. The pedestrian friendly model encourages building to the sidewalk, with pedestrian-attracting storefronts and entrances. TC2 encourages the antithesis of pedestrian friendly development. TC2 is proposed for the Wynnewood Square shopping center, currently the home of the Acme Market off Lancaster Avenue, the Wynnewood shopping center where the Giant and Bed Bath and Beyond are located, and assorted parcels along Lancaster Avenue approaching Wynnewood Road. TC2, like TC1, allows for 5-story buildings potentially rising to a height of 88 feet. There are no buildings of comparable height in the area aside from the Times Building in Suburban Square and the new One Ardmore Place on Cricket Avenue. First, allowing new development to claim on-street parking spaces in or near long-existing residential neighborhoods where the houses don’t have driveways, deprives residents of parking spaces they have relied on for generations. Second, the essential fallacy that location near a regional rail station means that cars are not a necessity for most residents persists despite decades of contrary evidence. The dimensional limits, height limits, buffers, setbacks and so forth for each proposed new zone are shown starting at page 86. There are drawings of the favored architectural types for each zone also shown at these pages.